When I saw Julia Ryan’s beautiful living room makeover on her blog Pawleys Island Posh, it was such a dramatic before and after that I had to share it with you. It’s so light and pretty now that you won’t believe how dark and dated it was when she first saw it! That’s a pretty amazing difference! Thanks to Julia for letting me share it with you. 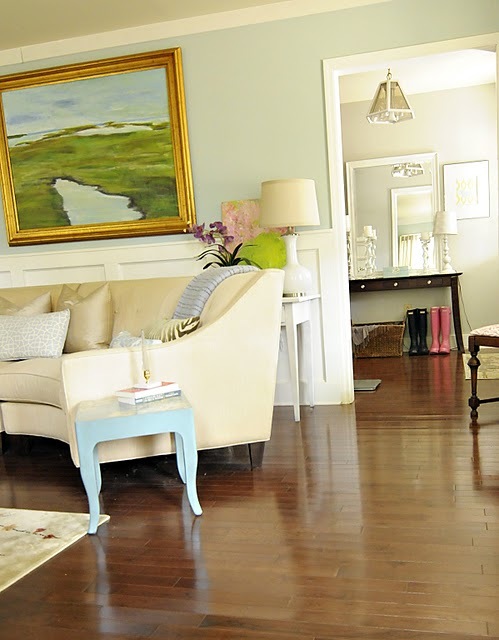 You can see the rest of her photos and read more about the makeover here: Pawleys Island Posh. This is a HUGE transformation! I went to her site before (she’s a sweetheart btw!) and I saw how talented this young woman is. I’m in love with her living room and I also love the wall color. Isn’t it so calming and fresh? Going to volunteer at my son’s school today. I always have the best time there!!! Forgot to say something: Happy Patrick’s Day!!! Such a major change! I know the homeowners are quite pleased with the end results. There are so many wonderful elements in this space. Although we can’t see them all, I know the other spaces in the house reflect this same greatness. I wonder if they kept the secretary in the before picture and updated it? What an amazing difference! It’s so beautiful now! We just bought a new house with a fireplace similiar to the old one pictured above. We have been debating what to do with it, so I was super excited to see this post this morning. The wood frame makes a huge difference. julia! these are so beautiful! 🙂 there is hope for me and my dark, dreary living room yet! thanks for sharing and happy St. Patrick’s Day!! Oh I LOVE it! We live near the beach as well and I’m trying my best to update our boring 80’s ranch into a beachy chic cottage. Just two days ago I taped a Tidewater paint chip to my living room wall and have been loving it, I think it’s “the one”. Thanks for introducing me to PIP, she has such amazing style!! Just beautiful, what a transformation. The home was so dreary before. LOVE this!!! Thanks for showing this – I am going light and bright everywhere too. This is a perfect way to show my hubby what is in my mind. I’m sorry but I have to say that the before pictures were taking with a regular camera and the after pictures were taken in another time of the day with a profetional camera. Although when the owners changed the dark furniture for new bright ones, new windows, white trims, and new painting it really made the difference. Is really a fantastic transformation. From sad to exciting! I wondered if they cut down some trees or something. A huge amount of light is coming from the direction of the windows in the “after” shots. Regardless, it is still a beautiful makeover. Thanks for posting it. I’m actually the photographer for both shots as well. The one major “technical” difference was the use of a wide angle lens in the after shots versus the kit lens in the befores. I also shot in automatic with a flash before and only recently have turned my flash off and switched to manual. If you read my original post I mention the removal of several tree limbs in the front of our home as well as taking off the window screens to bring in more light. There was no professional lighting or switcheroo in shooting times. Anyone who’s been in our home before we began renovations can attest that it was truly dark and dingy before, no tricks there! I love, love, love that couch! This house looks amazing! she even made that bad light fixture in the foyer look good. definately a cinderella story. Wow! It makes me want to grab a paintbrush! What a dramatic transformation. It just goes to show what can be done with a little vision, determination and hard work. wow! I can’t believe that is the same space! What a fabulous makeover. Looks like a magazine spread for Coastal Living. Thanks for sharing this. I must go check out some more. What a gorgeous makeover! Big difference, and I also love the paint color. So soothing! The slipper chairs are adorable! Love, love, love these pictures! Looking forward to heading over to her blog for more! 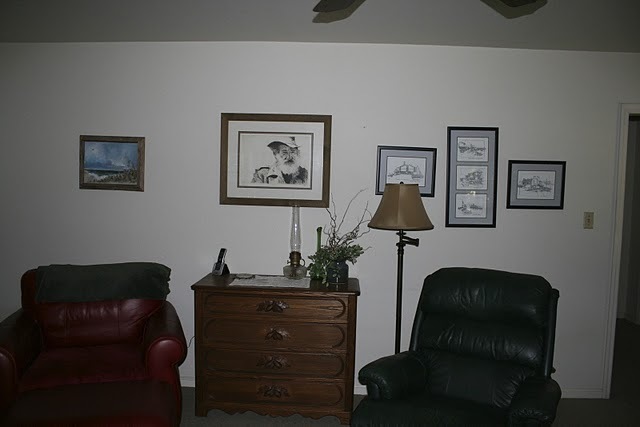 One of the first things I noticed were the paintings… a traditional landscape painting above the sofa and a more modern abstract one above the fireplace. I have such trouble with artwork in general. Everything from trusting myself to pick it out and choose the right frame to knowing where to hang. This room provides good inspiration, I think. WOW! That is an AMAZING transformation! I love it all especially those chairs! Amazing change. Thanks for sharing. P.S.Not crazy about Home Depot ad popping up. Have a hard time making it go away. Usually wind up at HD instead of your next page. Guess that’s the point!Could do without it, though………..
Yeah, you should be able to “click through to site,” but sometimes I think they get stuck or something. Sorry about that! Wow! I just adore the new wainscoting. That’s what we want to do in our living room. Hi Julia! Just discovered your blog and LOVE starting my day with you–you’re a better waker-upper than my coffee. I’m “hooked”! :o) Got a jolt when I saw she painted her living room the same color as my dining room. Is it wrong to feel smug over a paint chip??? Thanks again for the marvy posts! A wonderfully balanced combination of pattern and texture here! It’s subtle, soft and sophisticated, with just the right amount of pizzazz! I’ll have to check out her blog! Beautiful… love it. And thanks for the tip about the Target chairs! AMAZING!! She is really talented! 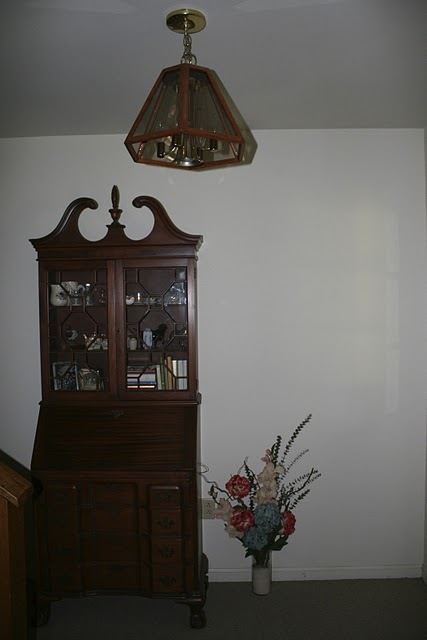 And I love how she just painted the ugly old chandelier instead of replacing it! Its warm and sunny in KY hope you’re enjoying the same! I have a vacation home at Pawleys and only wish I could have had Julia help with the decorating instead of the decorator I used who never keeps up to date fabrics and furnishings. I love how fresh this room is and how it reflects the light and airy feel of the coastal area. It really is an amazing transformation. Beautiful, warm, and peacful..Thank you! Very pretty! Didn’t see what color # was chosen for the walls, am looking for the same hue of paint for a bedroom. Would love to know it! I simply love what Julia has created, a haven of light and coziness.It is beautiful! Come and enter to win my Spring “Green “ Gift”. Wow! What an unbelievable transformation! It doesn’t even look like the same house! It’s so open, fresh, and inviting now. They did a beautiful job. 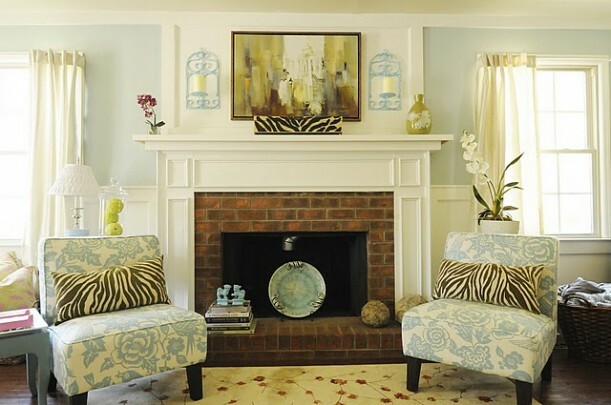 I love anything coastal inspired and they really nailed it with this makeover. It’s amazing what some paint and fantastic furniture can do for a home. P.S. LOVE the Target chairs, I want them all too! 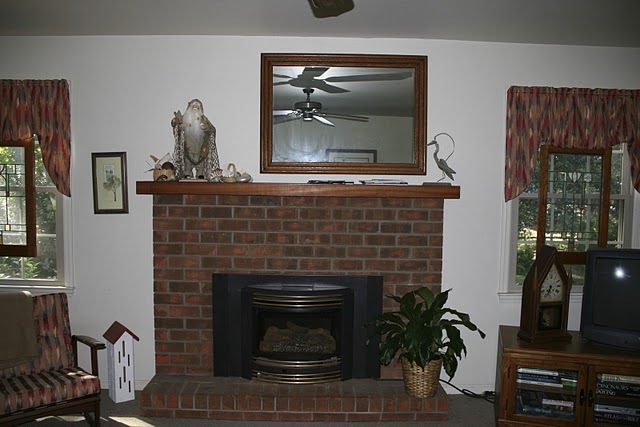 I like that they left the original brick alone and built a pretty new mantle around it. It really looks good! I love that paint color! Everything looks great! Wow. WOW! I have so much to say I don’t know where to start. First of all, small detail but I love that she recycled the ceiling fixture by painting it. SO clever! And the paint color is awesome — looks like Tidewater is very similar to BM’s Patriotic White, which I love for a seashorey house. The curved sofa is so brilliant for that room…what a great way to take advantage of the fireplace. Two BIG thumbs up! Absolutely gorgeous! I love everything about the after. What a transformation! I just LOVE it! Wowza…how is that even possible? Great before and after! Beautiful room…love how much brighter it is! Feels fresh and perfect for spring! Can you tell I have serious spring fever? Wonderful vision for the place! Blues are always my first choice to add a bit of personality too – you just can’t go wrong with them! Pretty changes. With the big chairs before, it was very overwhelming. I went and admired the chairs at Target.com after seeing them. I like the chair in “surf” best. (And my favourite colour combinations). PS: It helps that the furniture is lovely and soft too, in that picture. My budget doesn’t go so far as to ditch a brown couch but I’m replacing the squab with a turquoise fabric and injecting some more turquoise in the form of cushions. so gorgeous! awesome transformation, it makes me feel better just looking at it! Thank you again for the Elena’s home pics.. u’re unique! I just had another look at it (can’t sleep!) … it’s not just the blue that gives it the fabulous look – it’s the warm tones of the ceiling colour too. Wow – love it! WOW!!! I am SO OVERWHELMED with all the sweet words about my living room . Thank you so much Julia for feauturing my space! We absolutly adore spending time in our home now that it truly feels like “us”! Fresh and happy home! I would love to have a cup of coffee and relax in that room. Amazing transformation! Beautiful. I have that same secretary – the one in the before pictures – and I hope mine looks better in my house than that one does! Absolutely stunning! Love the shape of the couch! Wow, that is a stunning transformation! They were truly brought out of the dark and into the light. Love this room! Could you share the color on the ceiling?